The Olympics are here again, and I’m feeling that familiar emotional stirring. I love the idea of people working for years toward the goal of focusing their best athletic efforts on that “one moment in time.” Giving it all they’ve got to put their best self forward. That phrase, “one moment in time,” comes from the song of the same name sung by Whitney Houston and written especially for the 1988 Summer Olympics by Albert Hammond and John Bettis. When I’m more than I thought I could be. I will feel, I will feel eternity. That phrase, “when I’m more than I thought I could be,” captivates me. Everybody needs a moment like that. Everybody needs an experience in life where they surprise even themselves – a breakout moment where they go beyond what they knew they could do, and enter a “magic” realm in which it feels like anything is possible. A moment that seems like it’s outside of time, beyond ability, almost beyond imagination. The kind of moment we all dream of. I had a moment like that. No, my abilities lay in other areas. In high school, I played organ in a rock ‘n roll band. We were surprisingly professional. We were booked through a booking agency, and played on weekend nights at dance halls and events within about a 50 mile radius. We liked playing dances, but we REALLY enjoyed playing fraternity and sorority parties – especially at Miami University in Oxford, Ohio, about 35 miles away. My Mini Compact folded up onto a compact “suitcase” with a handle for easy carrying. 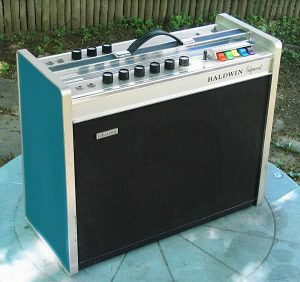 I ran it through a Baldwin Professional amp which had five colorful push-button “presets,” which were basically equalizer settings which changed the tone and sound of the instrument. I could make it sound like a flute, clarinet, or any of a number of other instruments. 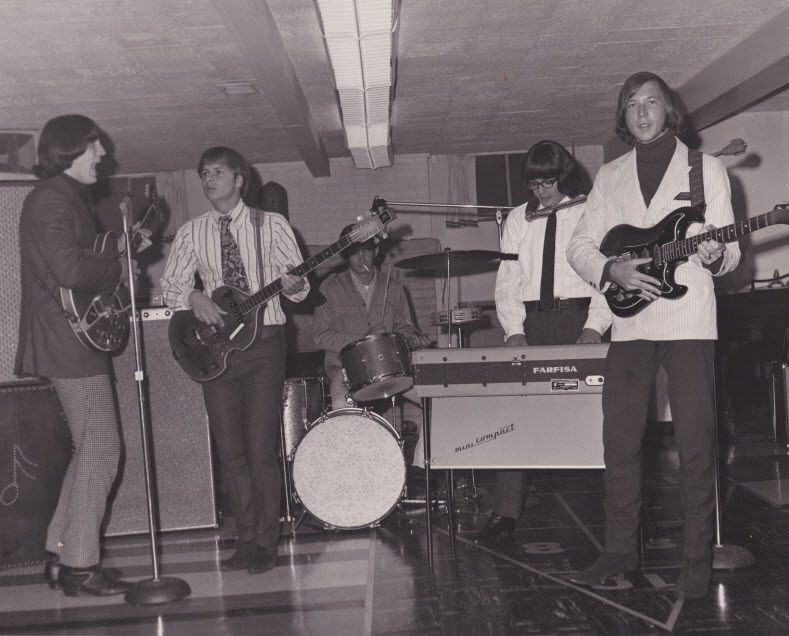 Most of the organ-driven songs of the day used the Hammond B3 organ – songs like “Give Me Some Lovin’” by the Spencer Davis Group (Steve Winwood) and all of Santana’s early stuff. Others used the Vox Continental – Bands like the Doors (“Light My Fire”) and the Animals (“House of the Rising Sun”). 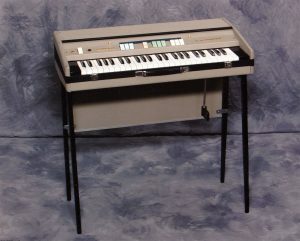 The sound of the Farfisa was more like that of the Vox Continental, and sounded very good on songs like “Light My Fire.” That particular song was one we would use once the evening really got going. We’d play about a 10-minute version, with each of our guitar players taking an extended solo, and myself taking a long organ solo. At one particular frat party, we had a particularly appreciative crowd that was really into the music. Everybody was up and dancing. Well into the evening, we launched into “Light My Fire.” By the time we’d each taken our first instrumental solo, the dancers had formed a conga line. They went around and through the dance area a couple of times, and then they marched out the door and around the outside of the house and then through the neighborhood. We kept rotating solos and they got longer and longer as the song went on. After they had gone outside, our solos became more experimental and abstract. We all began trying things we hadn’t attempted before – at least not while playing out. And it was all working! At some point, I really got going. I was doing stuff that was WAY beyond my ability, and just killing it. I’d be ready to hand it back to the guitar players, but Mike, our “leader,” shook his head, as if to say, “Just keep going.” I asked him about this later and he told me he just didn’t want it to stop. He knew I was playing way over my head and he couldn’t wait to see what I would try next. I was floored at the stuff I was playing. I seemed to be a third party observer watching myself do what I knew was miles above my skill level. I knew I was out of my league, and I knew I’d never sound this good again, so I just kept going. It was the most amazing, surreal, and fulfilling of experiences – all at the same time. I was “in the zone.” It was my “one moment in time.” By the time everyone got back into the basement of the frat house, and the song concluded, we had been playing “Light My Fire” for over three quarters of an hour! That experience, that moment, has inspired me to practice, to work, to shoot for other goals in my life that I likely would have rejected out of hand. A moment like that can inspire a lifetime of achievement, of ambition, of dreaming and reaching for more. Everybody needs an experience like that – at least one – to motivate and inspire, and to counteract the many “fall flat on our face” times we all experience. To remind us that it is possible to be more than we think we can be. For most of us, that “moment” will probably be one that only a very few people witness or know about – not something played out in front of millions of people, like the Olympics. It may even be a moment that only WE know about. That’s not what’s important. That one moment in time can fuel a lifetime of dreams and aspirations. Great story, Randy. Someone or something really did light your fire! I thought it was Ringo — this fan would recognize that voice anywhere. Too long on drums..
Those were truly some unforgettable times that set the stage for many things to come later. That band was very special for whatever reason. I remember we were in a big Battle of the Bands up in Columbus,OH the included 2,000 bands from five states and Canada. We showed up with no equipment, because they told us they were supplying all the gear to save time between changing bands. It turned out they didn’t have any equipment for us so we had to hustle and beg or borrow gear as we worked our way through the competition over that weekend. We ended up in the finals facing off with the Dantes, who were from Columbus and had several hit records under their belt. We ended up in second place, and of course we thought we should have won it. Just a few kids from Madeira High School out to conquer the world. The kids there didn’t know us and had never even heard of us, but they loved us just the same, rooted for us like crazy. Lots of great memories with the Offsets.